Charlotte has blogged on The Huffington Post UK since 2013 and sadly passed away on Tuesday 16 September from bowel cancer. She wrote one final post that she wished to share with all of her readers. We are moved to reproduce it from The Huffington and highlight the salient parts. This last blog post by Charlotte give us pause to reflect on what’s important to us and figure out how to get there. 1) I’ve always been a good planner. I like lists and tick sheets, to-do notes and objectives. I’m very good at starting things, but honestly, I am also easily bored and quickly lose interest once the original excitement passes. 2) I haven’t had the luxury of being allowed to be bored of having cancer. It isn’t something you can just give up if you don’t fancy doing it that day. There isn’t a switch you can chose to turn off one day from the next. At least not for me. From my first day as a cancer patient, I have attended every test, scan and appointment. I have tried every treatment offered, from the standard medical therapies, to eating oiled cottage cheese, having acupuncture and juicing kale. Cancer has become our life. Holidays, haircuts and helicopter lessons have all been timed around good or bad chemo weekends. Danny and Lu, unwittingly as innocent by-standers have had their childhoods protected but also dictated by my various regimes. This is all they have ever known and, I hope, have still managed to turn out to be pretty good, well-rounded, loved and treasured children. 3) The innocence that we have protected them from has now had to be revealed. Following my birthday, I started to feel ‘unwell’. We ‘popped’ to hospital where the usual set of tests were carried out. Unfortunately, when combined with a recent scan, the results were nothing short of devastating. We were no longer looking at a month by month action plan with a couple of months buffer at the end. I was given days, perhaps a couple of weeks to live. I wasn’t expected to leave the hospital, but somehow, have managed to pull it out of the bag at the last moment and return home, to spend what little time I have with my darling children and loving husband. 4) As I write this, I am sat on the sofa, relatively pain-free and busy doing my little projects, sorting out the funeral and selling my car. We wake up every morning, grateful I can have a cuddle and kiss my babies. 5) As you read this, I will no longer be here. Rich will be trying to put one foot in front of the other, to get by, a day at a time, knowing I will no longer awake next to him. He will see me in the luxury of a dream, but in the harsh morning sun, the bed will be empty. He will get two cups from the cupboard, but realise there is only one coffee to make. Lucy will need someone to reach for her hairband box, but there won’t be anyone to plait her hair. Danny will have lost one of his Lego policeman, but no one will know exactly which one it is or where to look. You will look for the latest update on the blog. There won’t be one, this is the final chapter. 6) And so I leave a gaping, unjust, cruel and pointless hole, not just in Halliford Road, but in all the homes, thoughts and memories of other loved ones, friends and families. For that I am sorry. I would love to still be with you, laughing, eating my weird and latest miracle food, chatting rubbish ‘Charleyisms’. I have so much life I still want to live, but know I won’t have that. I want to be there for my friends as they move with their lives, see my children grow up and become old and grumpy with Rich. All these things are to be denied of me. 7) But, they are not to be denied of you. So, in my absence, please, please, enjoy life. Take it by both hands, grab it, shake it and believe in every second of it. Adore your children. You have literally no idea how blessed you are to shout at them in the morning to hurry up and clean their teeth. 8) Embrace your loved one and if they cannot embrace you back, find someone who will. Everyone deserves to love and be loved in return. Don’t settle for less. Find a job you enjoy, but don’t become a slave to it. You will not have ‘I wish I’d worked more’ on your headstone. Dance, laugh and eat with your friends. True, honest, strong friendships are an utter blessing and a choice we get to make, rather than have to share a loyalty with because there happens to be link through blood. Choose wisely then treasure them with all the love you can muster. Surround yourself with beautiful things. Life has a lot of grey and sadness – look for that rainbow and frame it. There is beauty in everything, sometimes you just have to look a little harder to see it. 9) So, that’s it from me. Thank you so much for the love and kindness you’ve shown in your own little ways over the last 36 years. From the mean girls in the playing fields who pushed me into the stinging nettles aged six to the bereaved husbands who in the last week have told me what their wives did to help prepare their young children and everyone in between. They and you have all, in some small way helped me become the person I have been. 10) Please, now use that love for me and pass it to Rich, my children, family and close friends. And when you close your curtains tonight, look out for a star, it will be me, looking down, sipping a pina colada, enjoying a box of (very expensive) chocolates. 1) Who is the biggest band in the world? 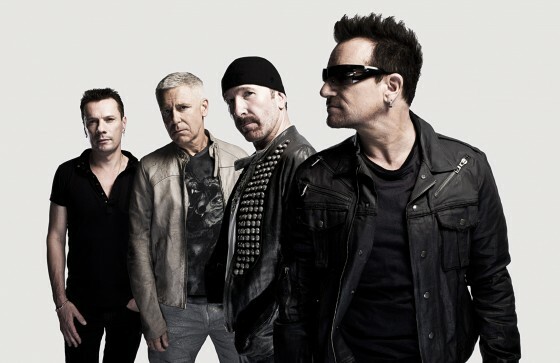 Without doubt, it’s U2, the Irish pop-rock band formed in 1976. 2) U2 has sold more than 150 million records and recently set a world record for grossing over US700 million in its most recent global live concert tour that lasted 2 years and sold 7.2 million tickets. 3) Far from exploiting raging hormones like pretty boy and gal pop bands that bare more skin than actually sing and play their instruments, U2 sticks to its working class roots and perform live, playing their instruments and sing songs of life’s roller coaster ride, social issues, democracy, hope, redemption, freedom and love. 5) This is a band that is not afraid to push boundaries and its recently concluded world tour is testimony of that unceasing determination. [Lesson 2 – Collaboration and working in a good supportive team makes you so much better] The video below will give you an insight of the massive work behind every show in their 360 world tour, the financial risk they took and the phenomenal engineering expertise, talent and collaboration that made each show possible. A lot of time, we celebrate the performers but forget the effort of the crew working hard behind the scenes to make it all happen. 6) For readers new to U2, do watch them on YouTube and be wowed by the incredible talent of the boys, (now uncles) from Dublin which we have the privilege to witness and grow up with. Like U2, all of us can craft our own legacy and make a positive impact in our own little way! A smashed iPhone and Blackberry phone was found beside his lifeless body. According to sources, the Hong Kong Chinese native had confided in his colleagues that he was facing tremendous stress at work. Other sources pointed that he had received news that he was facing the sack. Security tried in vain to stop him from jumping 30 storeys to his death. Nobody should have to face such an untimely demise due to work related stress. Remember, that you are defined by more than your job. A job ultimately compensates you for the time and effort you exchange to make profits for the company. To put it bluntly, a job pays you a wholesale rate while your employer charges the ultimate clients a retail rate. That’s all there is to it. Don’t let work stress rob you of your life. See a counselor or quit your job if necessary. Take a step back to evaluate if the current job is really for you. The litmus test is this. If you find yourself relishing the challenges of your job and actively seek solutions, then all is good. But if you don’t, you might simply be in the wrong job, that’s all. There’s no shame in walking away. Just like you can’t get an Olympic swimmer to challenge for top honors in a 100m land race, you can’t perform if you’re not in the right job and environment that plays to your strength. Do you think Michael Phelps, the American champion swimmer and the most decorated Olympian of all time can ever beat the fastest man alive, Usain Bolt in a 100 meter dash? Likewise, do you think Usain Bolt can ever outswim Micheal Phelps? Your life is limited. Your work is not. All of us are dispensable. See how Apple continues to shine with the departure of Steve Jobs? We wish that all friends of Empower Advisory find a fulfilling, satisfying vocation! Fear and self-doubt comes in all forms. If you have ever discouraged yourself from doing what you had planned, you’ll probably know what we mean. The typical way to magnify self-doubts and fear would be telling yourself “You can’t do it,” “Don’t be stupid”, “What if it goes wrong?”, “What if you mess up?” The list of self bashing questions goes on and on. But hey, you have a choice. You can either cave in to the negative self talk or work on how to acquire the skills and knowledge to move forward. You’ll be pleasantly surprised how this simple twist can spur your inner well of creativity to think up solutions to move forward. Give it a go! Break free from your self doubts and imaginary fears today! Poor goal setting is the reason many people fail to achieve the change they want to see in their lives. Many a times, the goals people set for themselves are fuzzy with no specific details and action plan. It’s almost as if they lack the confidence to go down to the nuts and bolts of the plan or just want to soak in the feel good warmth of their imagined success. Make your goals a reality by applying the wise principles of S.M.A.R.T goal setting. S.M.A.R.T is an acronym for the 5 steps of Specific, Measurable, Appealing, Realistic and Timed. S-pecific – What do you really, really want to achieve? M-easurable – How will you measure your progress? A-ppealing – How magnetic is your goal? R-ealistic – How realistic is your goal? T-imed – When do you want to achieve your goal? S-pecific: “I want to set aside at least 1 hr of free time for my children” is more meaningful to grasp then “I want to spend more time with my children”. A more specific goal, allows you to better focus your energy and mobilize your resources to make it happen. M-easurable: A goal without a measurable outcome is like a movie that goes on and on. You just won’t know where the finale is and if the loose ends of the plot is finally tied. Don’t create unnecessary uncertainties for yourself. A measurable target is a reminder to keep yourself focused on the results you want to attain. Using the above example, if 1 hr is your target, you’ll know in an instant if you have met your goal. A-ppealing: How inspiring is the goal to you? The goal must be magnetic enough to make you persevere through the challenges that will come your way. R-ealistic: Yes by all means dream big but do keep one foot based in reality. A goal that is unattainable and far-fetched will have you waving the white flag soon after you have hatched your goal. You don’t just snap your fingers and say, “I’m gonna create the next Facebook tomorrow.” Facebook, for all its success is not an overnight miracle that came out of an ah-ha moment. Its main founder Mark Zukerberg started learning programming as a kid and had private programming tuition from software developer David Newman. This laid the foundation to the culmination of events that eventually led to the creation of Facebook more than a decade later. T-imed: Goals don’t get done when you operate on a rubber timeline. A time frame allows you to monitor your progress and make adjustments along the way to hit your target. For example, knowing that you’re going to be late for work naturally spurs you into action to think of alternatives and faster ways to reach your office. Without knowing the cut off time for your targets, you’ll be drifting along and soon lose sight of your goals. Think about this. About why you were hired. You were NOT hired to do a job. You were hired to SOLVE problems. That’s all there is to a job. (Let’s leave the Wall Street greed mantra at the door for a moment). All jobs are created to solve problems. At NTUC Fair Price, cashiers key in/scan the prices for you so you don’t make a mistake, deliberate or not. They load up the groceries in plastic bags for you so you don’t overload the bag, which might cause the bag to burst; you don’t underfill them or help yourself to extra bags and you don’t slow down the line while you load the groceries with your idiosyncrasies. So the cashiers were hired to solve all these problems. Cashiers who see their job as repetitive and routine will waste no time to bail out. Cashiers who can see themselves as problems solvers will be easier persuaded by management to stay. How does this relate to you? When you work for a company or organisation, chances are that you find yourself at times slipping into DOING a job, and see your work as just a series of task without a meaningful purpose. To re-discover the purpose of your job, think about why you were hired and if that purpose still resonate in you. If it still does, it would be easier for you to be motivated to overcome the challenges you face at work. If it does not, or your organisation is filled with superiors or colleagues who do not appreciate your work and support you to achieve the meaningful purpose that drew you into your job in the first place, it is a good signal that it’s probably time to move on. You are most happy and driven when your needs (food, shelter, money etc), abilities (skills, knowledge etc) and purpose (to serve, leave a legacy etc) come together in your chosen choice of employment. Finding that purpose is not the icing to the cake. That purpose is the rocket fuel that makes you alive each day, driving you to think of ways to overcome the challenges you face in your job. Find it. Breathe it. Live it.